Combine the fun of camping with a city break sightseeing in Vancouver. From oceanside lots to suburban spots, these five campgrounds are all within a reasonable drive or transit ride from the city. Some are open year-round while others are seasonal; reservations are recommended, especially during the summer months. Northwest of Mission, less than an hour’s drive from Vancouver, Rolley Lake is ideal for swimming, fishing, and canoeing in the summer months. Named after the honeymooning homesteaders James and Fanny Rolley who set up home here in 1888, Rolley Lake went on to be the site of a small Japanese-Canadian hand logging operation in the 1930s. Now there are 64 camping spots hidden amongst the tall second-growth conifer trees, and the campground is flat and easily accessed by car. Active nature lovers can get a kayaking and hiking fix at Anmore campsite, which is located at the entrance of Buntzen Lake, flanked by Eagle Ridge Mountain and Buntzen Ridge. Only 45 minutes east of Vancouver, and close to Coquitlam and Port Moody, the campground has easy beach access and has sports facilities, including a volleyball court and swimming pool, for the summer months. 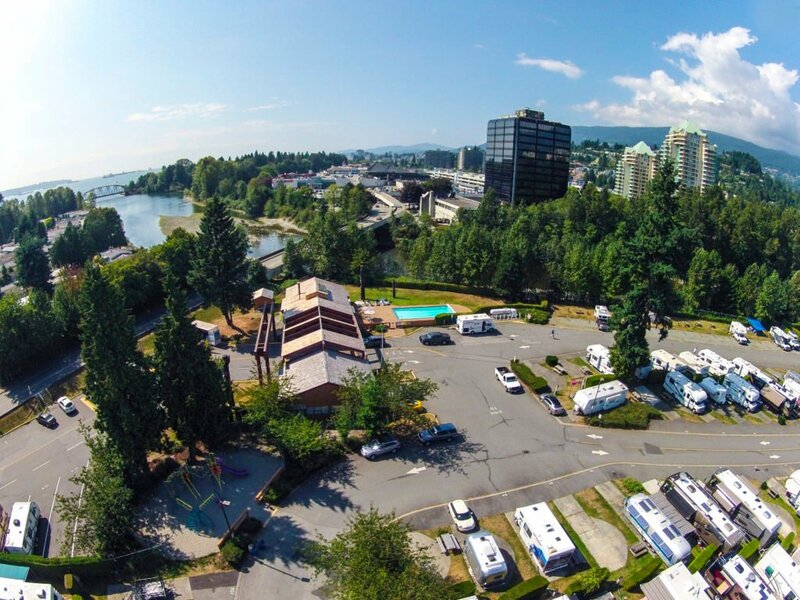 Built for Expo 86, the Burnaby Cariboo RV Park has long been a favourite camping spot due to its central location in Burnaby, less than 30 minutes from downtown Vancouver. Bus and SkyTrain transit links, and organized Vancouver and Victoria tour pick-ups, make it an easy camping spot for non-drivers. Open year-round, the RV park’s separate tenting area features a gazebo with hot water, and a granite picnic table at each spot. Guests can relax in the indoor pool or Jacuzzi after sightseeing, and check out the games room and TV lounge. 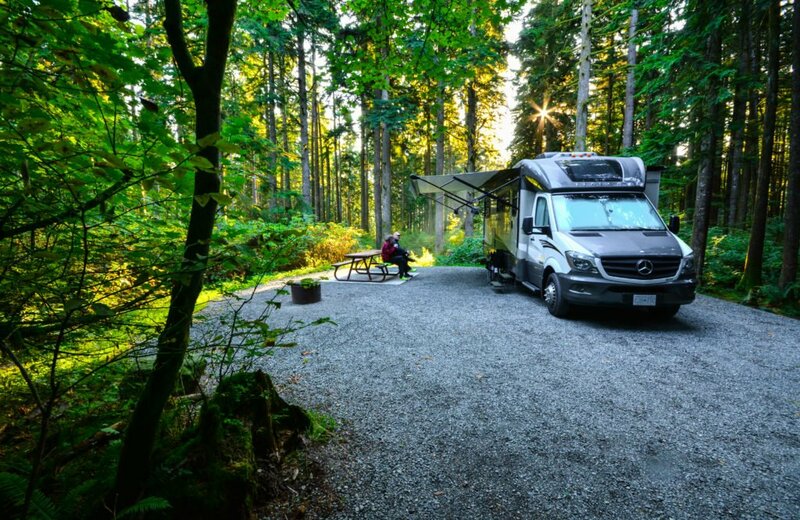 Vancouver’s closest campground, Capilano River RV Park, is tucked alongside the North Shore of Burrard Inlet near the Lions Gate Bridge, just a short bus ride or bike ride to downtown Vancouver. Family friendly (including four-legged furry members), the campground has a children’s playground and pool as well as free Wi-Fi, a recreation lounge, and hot tub. Hop over the bridge to check out Stanley Park’s beaches and trails or explore downtown Vancouver. North Shore attractions such as Capilano Suspension Bridge, Grouse Mountain, and hiking trails through Lynn Valley or Cypress Mountainare all within easy reach. Family-run since 1989, this RV and tent campground includes 11 hectares (27 acres) of landscaped greenery in South Surrey, close to the ocean and transport links. Minutes from the US border, Peace Arch RV Park is also only 45 minutes away from Vancouver. It’s also within 15 minutes of beaches at White Rock and Crescent Beach, as well as wildlife habitats at Boundary Bay Bird Sanctuary and George C. Reifel Migratory Bird Sanctuary. Nearby is the Tsawwassen Ferry Terminal, which takes sightseers to Victoria and the southern Gulf Islands via BC Ferries.